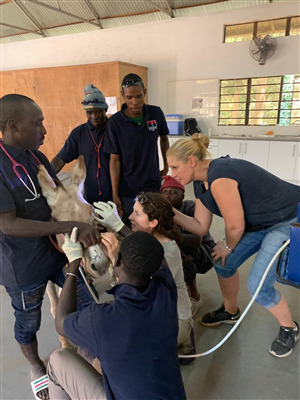 The BEVA Trust sent Sara Fleck and Christine Fuchs to the Gambia Horse and Donkey Trust to support veterinary care and education out there. they share their experience with us..
At the start of December Christine and I travelled out to The Gambia to spend 2 weeks with The Gambia Horse and Donkey Trust. The Trust was founded in 2002 by the late Stella Marsden and her sister Heather Armstrong (who remains director of the charity). Heather and Stella spent their childhood in The Gambia where their father ran the Forestry Department and later became the first director of the Wildlife Department of The Gambia establishing the Abuko Nature Reserve. The Gambia is a former British colony and gained independence in 1965. It is the smallest country on the African continent and remains one of the poorest. Donkeys and horses are an essential and valuable asset to farmers in The Gambia. A healthy working animal can increase a farming family’s income by 500% however the combination of poverty, poor management, high disease rate and a lack of veterinary support leads to serious animal welfare issues and further compounds the struggles faced by their owners. The aim of the GHDT is to reduce rural poverty in The Gambia through improving the health, welfare and productivity of working animals. The initial part of our trip was spent at the charity’s new centre in Makasutu, 30 minutes from Banjul International Airport. This site was built 2 years ago on land donated to GHDT in the Makasutu Reserve. It comprises of a large administrative and accommodation centre that contains a downstairs visitor centre in which to hold classes and seminars, and accommodation for volunteers above. There are fenced paddocks for long term resident donkeys and horses (and Prince Harry the camel, rehomed from the exiled ex-Presidents wildlife collection! ), a yard of stables and a large treatment centre with storage for supplies and equipment. There are 2 long-term volunteers currently based at the Makasutu site – Katana Ashby from the UK and Karelhia Garcia-Lopez from Venezuela. They have wide-ranging roles but are key in helping to coordinate care for the resident animals at Makasutu and helping short term volunteers to use their time and skills most effectively to help the charity. GHDT employs para-veterinary staff, who provide excellent care for patients admitted to the centre, as well as training apprentices – future para-vets. One of the key roles of veterinary volunteers is to ensure that they impart as much knowledge and teaching as possible to the para-vets and apprentices. We also learnt a huge amount from the para-vets themselves as they introduced us to diseases that they treat on a regular basis, but that as vets in Europe we had never come across! This included cases of trypanosomiasis, epizootic lymphangitis and many incidents of fistulous withers caused by harness injuries. As part of this exchange of knowledge we gave regular seminars and practical tutorials on a wide range of topics including pharmacology, naso-gastric intubation, treatment of colic, assessment and ultrasonography of the eye. Each morning we worked through the resident cases, discussed and treated them with the para-vets and apprentices and used each case as an opportunity for teaching and discussion. The GHDT’s Annual Show was held on 8th December at the Abuko Showground. The trees were festooned with ribbons and bunting and farmers arrived to show their donkeys and horses in various classes. Free head collars, harness padding and high-vis safety vests were handed out and stations were set up where farmers could bring their animals for treatment by vets, equine dental technicians and farriers. Approximately 80 donkeys arrived at the show and it was fantastic to see the huge pride of those showing their animals and winning a coveted GHDT rosette. The show is a great opportunity to communicate the aims and objectives of the charity to the local community, to recognise farmers for excellent care of their livestock and allow those farmers in need of help for their animals to access equipment and expertise. Towards the end of our trip we travelled 4 hours east of Makasutu ‘up country’ to Sambel Kunda, the original site of the Gambia Horse and Donkey Trust. The Sambel Kunda centre is based in a much more rural and remote area than Makasutu but a similar infrastructure is in place with para-vets caring for resident animals and providing regular trips to surrounding villages to provide education and mobile veterinary care – these are known as ‘treks’. We went out to several villages ‘trekking’ during our stay and saw a wide range of different injuries and illnesses. Any animals that require treatment that cannot be provided during the visit are then transported back to one of the two centres for further treatment and care. One of the great challenges at the GHDT is the unpredictability of supplies and resources. It is incredible how frugal the para-vets are with medication and materials. This seems to rub of on volunteers as well and we were both very impressed by this alternative to a centrifuge (see picture left) created by Ed, a previous volunteer! Throughout our visit we were continually inspired by the determination of the para-vets to improve animal welfare in their country, both by treating animals under their care, and by educating farmers as to how best to care for their animals. 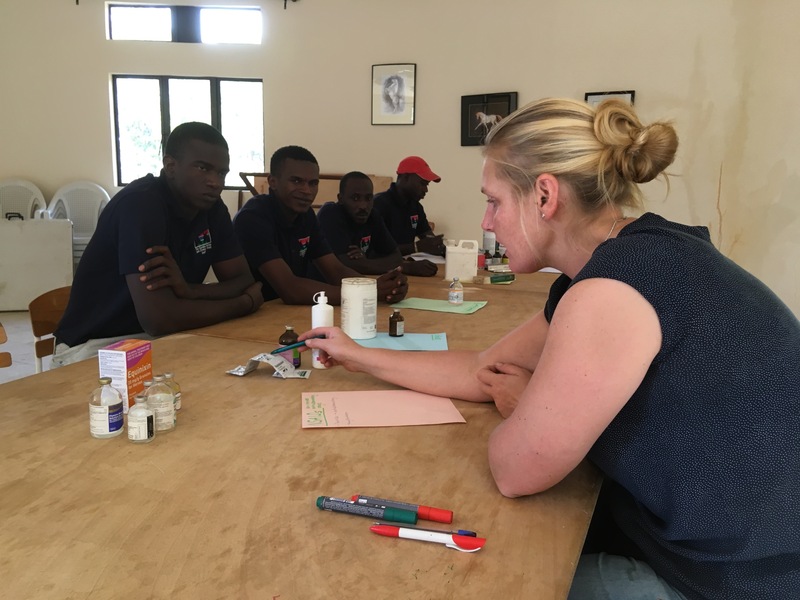 There is a continuing role for visiting volunteers, vets, farriers and equine dental technicians to contribute their skills and knowledge to help the education of local people and to continue the development of the GHDT staff. 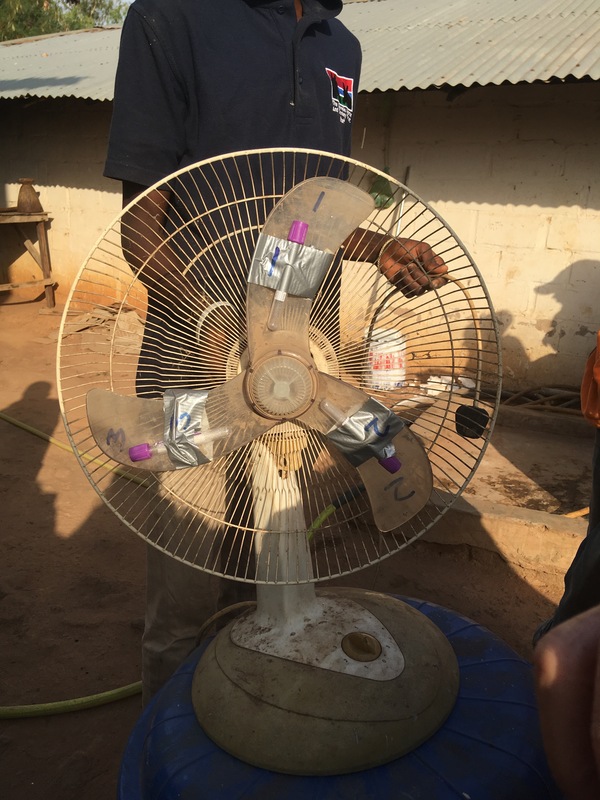 In the words of Heather Armstrong –‘We believe in providing the Gambian people with the skills and knowledge to prevent and solve their own problems, creating a long term, sustainable solution’ and this is clearly being achieved. We both returned to our day-to-day lives with a determination to promote this aim, and every intention of returning to The Gambia Horse and Donkey Trust in the future. 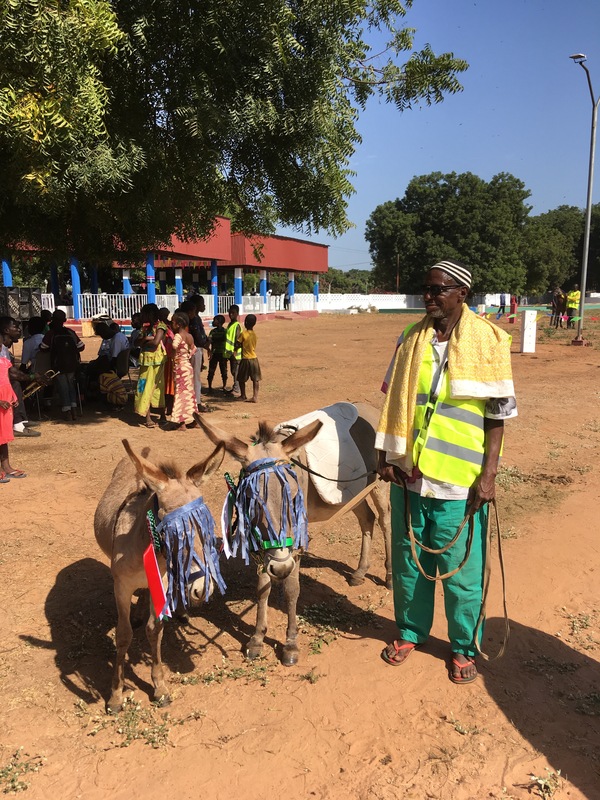 Progress, Peace, Prosperity is the national motto of The Gambia, and each day at the Gambia Horse and Donkey Trust sees their staff working tirelessly towards those goals.